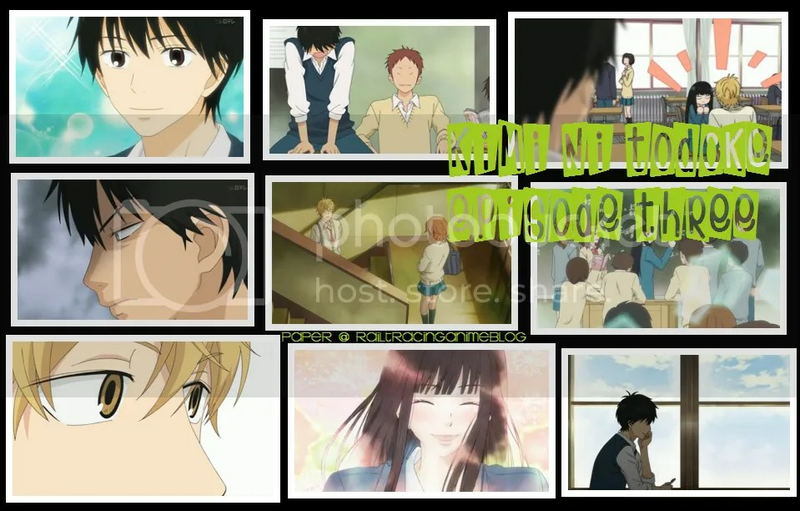 Kimi Ni Todoke: Episode Three. This episode ended right when it was getting good. It’s been quite awhile since we last saw Sawako smile so genuinely and I wish we could get to see it more often but then it might have less of an impact than when it’s rarely shown. I thoroughly enjoyed this episode because I got to see a side of Kazehaya and his personality are more defined than in the previous episodes and season. From the beginning he was portrayed as a character who always smiled, always happy, always helping others, and always had good intentions. In short, they created this false imagery of a person who was flawless and always kind. This episode proved those misconceptions that people who aren’t close to Kazehaya have of him. He can get jealous and frustrated when he sees someone else getting close to the girl he ‘has his eyes on’. Ooh, and it was entertaining to see facial expressions I thought Kazehaya would never make. We were shown the real Kazehaya and he was saying what was really on his mind like when he said something like, ” When I think of her with someone else, it really bothers me”. Kent being the cause for Kazehaya’s jealousy is probably only intersted in Sawako in a non-romantic way, I guess. He’s getting pulled deeper and deeper as he’s seeing more and more of Sawako’s rare genuine smiles. It possible that eventually, this interest will blossom into love. It’s plausible but we’ll have to wait and see. The reason why he’s doing so many things is just so he can see Sawako’s smile. Well, I’m really excited for the next episode mainly because I’m interested in what Kent has to say Kazehaya. I doubt he’s going to declare that he’s going to compete with Kazehaya for Sawako’s love since.. he probably doesn’t feel that way towards Sawako [yet]. It might be that Kent may plainly state that he has no intentions of taking Sawako away from him and that he’s just curious about Sawako.. Another thing that I’m interested in is how Sawako’s going to fix the situation with her and Kazehaya. Will she be able to say what’s really on her mind when her relationship with him is on the line? This entry was posted in Anime, Currently Watching, Kimi Ni Todoke 2 and tagged anime, kimi ni todoke 2, shojo. Bookmark the permalink. Also, is it me or is the drawings/animation getting better over the episodes? I love the OSTs too ;A; so beautiful.. He should have just went over and taken Sawako away from Kent. Haha yeahhh I know, but lol it’ll happen sometime soon.. I think…. OMG, I give up being a procrastinator. Lol, it’s too stressful. LOL don’t waste your time like i do for no reason haha x) but I’m ACTUALLY DOING MY WORK NOW!! AMAZED? Lol, really? you probably barely did anything, aha. jk. So then how much do you have finished? I think the storyline is so captivating and the OST just blends in so well that I don’t really pay attention to anything else. Seriously, I was really focused on the dialogue of episode four. Uhh -___- like 1/8 of my work is done… that’s a start.. I guess…. Haha really? I just tend to get distracted by little things I see in the animation XD so I have to watch it over and over again. Lol.. no.. it’s barely a start. When you round it, it’s a zeroooo. Dude.. no wonder you barely get anything done. ahah. You spend most of your time rewatching.. rewatching.. and rewatching..
OMG, lol, gotta tell you something.. Okay, so remember in Angel Beats when there was that one scene where Yuri presses a button and the guys’ chairs whirl up and hit the ceiling.. while that happens, it’s in slow motion and the slow song starts playing. Remember that? Well, that scene randomly played in my head and I started laughing… but I put my head down before I could burst out in laughter. -___- well if you don’t round it it’s more than a zeroooo. haha that’s true.. al of my wasted time goes to rewatching… and rewatching…. Lol, well, we always round it so it’s a zerooo. Yes, when all of that time could be spent doing other stuff that is more productive. Lmao, Yeahhh~ It’s pretty refreshing when I remember funny moments of different animes when class gets boring. Ooh, I heard there’s going to be a second season but with different characters. Lol haha yes I really know how to spend my time efficiently right?? Haha it is, but the bad thing is sometimes I laugh in class while thinking about it. -_- .. SERIOUSLY??? I never heard about that! But I don’t think it’d be as good as the first season. Lol, people will give you that ‘what the heck is she doing laughing by herself’ look. Hmm, I can’t remember where I heard it… It’s a rumor so I’m not 100% positive that I am right. I think that it might not have the same impact as the first season if it follows the humor of the first season but nonetheless, I’ll still be excited about it.